Blogius is a clean and elegant blogger theme which offers great customization to create the blog that you want. It is suitable for wide-range of blog such as personal blog, fashion, photography, travel etc. It is built by latest design trend and using advanced development tools. 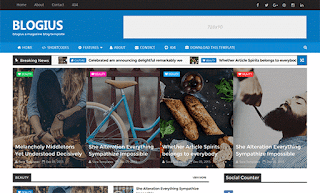 Blogius Blogger Template is responsive theme optimized and displayed perfectly on any devices. 2 Responses to "Template Blogius"